West Virginia is one of several states that is home to the Marcellus Shale (also known as The Marcellus Formation). The Marcellus Shale is a geologic formation of sedimentary (shale) rock that contains natural gas, and is one of the largest onshore natural gas fields in North America.. The Marcellus Shale is known to be deeper on the southeast edge of the formation that borders the ridge and valley regions of West Virginia, Pennsylvania, Maryland, and New York. The shale is located deep below the earth’s surface and, when fractured, can produce a large amount of natural gas. There are two types of natural gas coming out of the Marcellus Shale: dry gas and wet gas. Dry gas comes to the surface nearly ready for market, needing little or no additional treatment. Wet gas contains other liquid compounds, such as ethane, propane, pentane, and butane. These natural gas liquids need to be separated from the methane to ensure the natural gas sent to consumers has a consistent BTU. Wet gas is currently considered to be more valuable in the marketplace as the natural gas liquids have inherent value as a commodity. Marshall, Ohio and Wetzel Counties all lie in the “rich” gas fields, having both dry and wet gas. 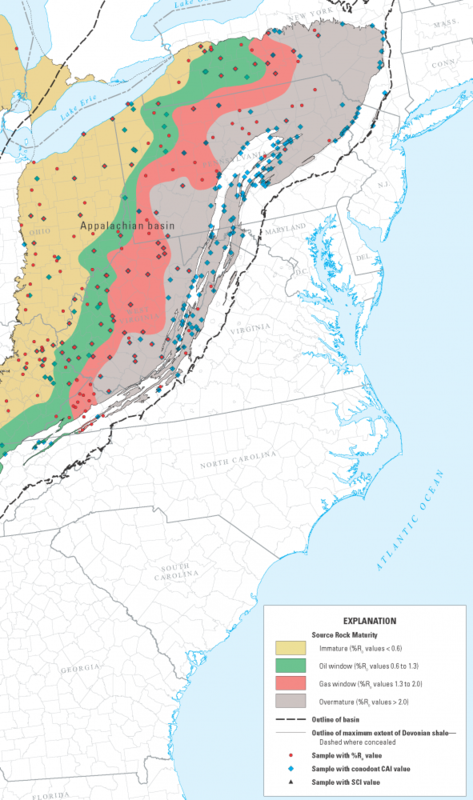 Interest in the Marcellus Shale in West Virginia has drawn companies from other parts of the United States and the world to lease land, acquire companies with acreage positions often held by shallower production, and begin to drill both vertical and horizontal wells to evaluate the gas potential of the Marcellus. With the development of new methods for the exploration and development of unconventional reservoirs such as those found in the Marcellus shale formation, West Virginia, along with other states in the region, has seen significant increases in exploration permits since 2005. In fact, West Virginia Marcellus shale permits issued through 2008 exceeded those of other Marcellus shale states. The Marcellus shale is but a portion of the entire oil and gas activity in West Virginia. In addition to Marcellus, other oil and gas plays (e.g., Coal Bed Natural Gas, Ohio Shale, Trenton-Black River, etc.) have and will continue to contribute to the State’s economy. Development of the Marcellus shale will have a significant and positive impact to the overall economy of the state that will be in addition to the State’s ongoing oil and gas development. Shale gas development in the state promises to increase economic activity and have far-reaching benefits. Through direct, indirect, and induced economic activity, these wells contributed $371 million in gross economic output, $189 million in value added, $86 million in direct payments to households, over 2200 jobs, and $68 million in taxes. West Virginia ranks 11th for natural gas production, and is the only net exporter of natural gas east of the Mississippi River. For more information regarding Marcellus Shale and the natural gas and oil industry in West Virginia, check out WVONGA (https://wvonga.com) and IOGAWV (https://iogawv.com/).